RTIC Can Cooler for All Your Needs. You are a lucky beggar because you have found this article. In this comprehensive review we will tell you about RTIC koozie. Bet you had many situations in your life when you were making first such a long awaited sip of your cold favorite beverage and found it warm. Disgustingly, isn’t it? Of course after it you immediately put it to the fridge and tried to give it a second chance, but of course, even after chilling, its taste was not excellent. To cope with such problem and save yourself from permanent disappointing with warm drinks we recommend you to choose high-quality koozie for all your needs. In this article we gonna tell you about RTIC koozie with which you will forever forget about disgusting warm beverages. Beside premium features this koozie will also please you with its price, especially if you have checked a price of Yeti Colster before. RTIC Can Cooler. What Is It and How Does It Work? > This product page on Amazon has tons of them. While opening the box you will not see any extra details, you just notice the product which is ready to use immediately. 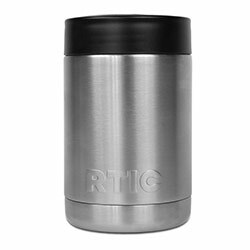 RTIC koozie is put in a special plastic cover and is shipping in the box that protects it from damages during process of shipping. One more very pleasant moment is that you will not also notice any promotional papers with you can cooler that many manufacturers like to put into the box together with your koozie. For example while purchasing can coolers like the Yeti Colster you will definitely receive a stack of promotional papers together with your order. The construction of the RTIC koozie will somehow reminiscent you about an actual cooler. This koozie has the same body made of the stainless steel that provides you with good insulation level. For providing users with an easy access to the can, a special circular locking gasket is placed over the top of your koozie and after it this gasket is twisted into a place to lock cold inside maximally. As a result you receive a drink that is easily accessed for drinking but is still completely insulated to provide you with the maximum duration of cold retention. 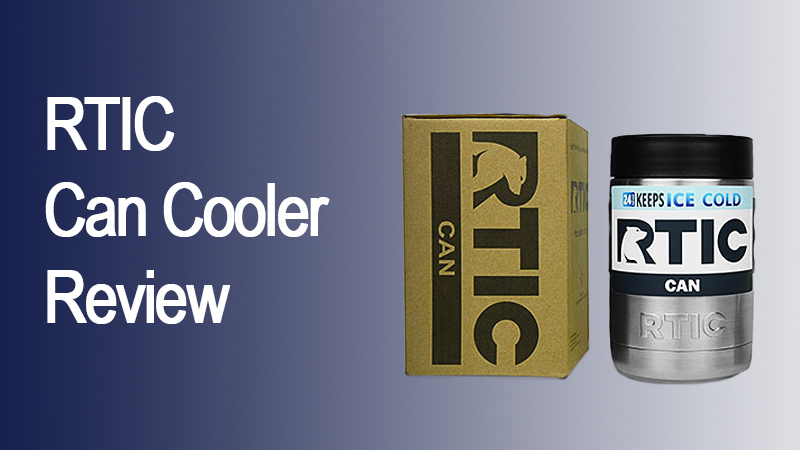 If you have already read about RTIC cooler in our RTIC cooler review (if you have not seen, then you can read it here) you definitely noticed a discussion about its ice retention terms. In this article we are talking about RTIC can cooler that doesn’t contain ice, so any controversial moments will not occur. With this koozie your beverage is able to stay cold for up to ten times longer. It is a great duration of cold retention because with such can cooler you shouldn’t swallow you drink in a hurry because you are worry that it will become warm until you drink it completely. No more hurry, no more warm drinks, only tasty cold beverages. Available Size of RTIC Can Koozie. Another great feature of RTIC Can Koozie is its size. This koozie is specially constructed to fit almost every cup holder available in the market. It means that you are able to take it to your long journey and enjoy your favorite cold soda even while driving. With the cup holder friendly design ths Koozie will become your reliable partner in each your trip. We are sure that can with your favorite cold beverage will become a great addition to any trip or walk wherever you decide to go. The one main problem that also occurs when using cold bottles or cans is their sweating exterior. This situation leads to several problems. Firstly you receive a warm drink instead of cold one and secondly you leave water spots from the wet bottom of your can or bottle everywhere you drink. The koozie reviewed in this article is created with using of special anti-sweat technology that will allow you to forget about using various coasters and wet spots on the each surface where you at least once put your bottle. Thus, you can forget about water rings and warm drinks thanks to this feature of RTIC Can Cooler. Quality of the RTIC Can Cooler. This Can Cooler consists of two separate parts- locking gasket and housing. Let’s consider each of them separately. The body of this can cooler is made of stainless steel as it has been already mentioned above in our article. The special construction of double walls provides you with good insulation and helps to lock cold inside for rather long time periods. Exterior and interior of this koozie is made of highest-quality durable material that is able to withstand a lot of external interventions and will last you for many years. Another part of RTIC Can Cooler is its locking gasket. This part is designed for locking a cold inside this koozie for maximally long time periods. After you put a bottle with your beverage inside this koozie you can slip this gasket over the top and turn it in order to lock the beverage into place thereby locking cold inside too. Not bad, yeah? When looking for products with similar characteristics you will not find prices that are even close to this. At such price tag you can purchase some can coolers and take them for a walk, trip and to your office. Thus, the price of RTIC can cooler definitely leaves all other manufacturers far behind. A Little Bit From Users’ Reviews About RTIC Can Cooler. 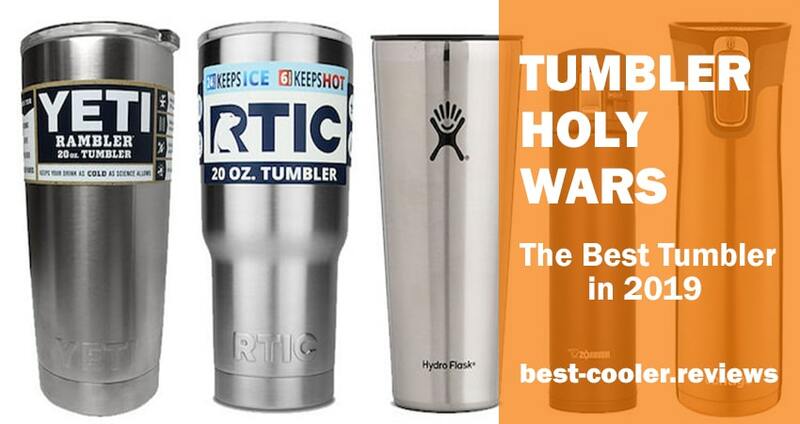 RTIC koozie keeps beverages cold as long as other famous and popular brands do. Many users compared it with other world known brand and confirm that RTIC doesn’t inferior to them by its characteristics. Unbelievably low price that is equal to the THIRD part of price that is offered by other manufacturers. These were the two main statements from lots of users. Our team confirms both of them and affirms that this koozie has the same high-end characteristics as well known promoted brands, but at significantly less price. RTIC Koozie or Yeti Colster. Who Will be the Winner? The main competitor of RTIC Can Cooler in the world market is well known Yeti Colster from famous YETI brand. Many users compared these two products in their reviews but we decided to help you make your final choice by providing you with short comparison table with the essential characteristics of both these can coolers. By comparing these can coolers we want to show you that not only well known brands can boast of high-end characteristics and premium quality, but other brands too. Let’s not be in a hurry and you will see everything with your own eyes. Welcome our two participants- RTIC Koozie and Yeti Colster. Let’s make the battle started! After considering the main characteristics of these both products you may have seen that they both are almost the same. The difference is only in their price. And this difference is TREMENDOUS. Yeti Colster cost is equal to the cost of three! RTIC can coolers. 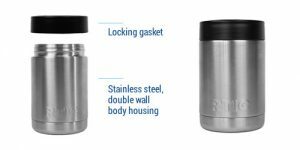 Both of these products consist of two separate parts in their construction- durable circular locking gasket and stainless steel body for the high insulation level and durability. All that you should do when using someone of these two options is only to place a bottle with your beverage inside the housing, place a gasket on the top of the bottle and screw it for locking these two pieces together. These both options provide you with the long duration of cold retention period thanks to the double walls construction. 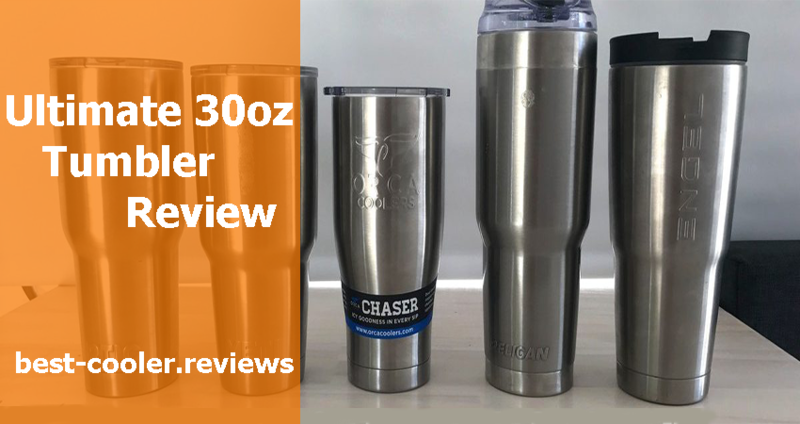 One of the users wrote in his review that he tested the engraving on both these can coolers and made a conclusion that the engraving on both products of Yeti brand and RTIC brand was equally excellent. RTIC or Yeti Colster. Who is the Battle Winner? So, do you want to know the outcome of this battle? Most of you may have already guessed it. In this competition we have decided to make the RTIC Koozie a winner and we were based on several arguments when making this decision. Firstly all you need is high quality, right? The quality of characteristics of these two can coolers is equally high. Both of them can provide you with similar premium features. Secondly, design. The design oh both these options is modern and stylish, they both don’t have any extra unnecessary options. And the last parameter – cost. The price of YETI Colster and RTIC Koozie is really different. 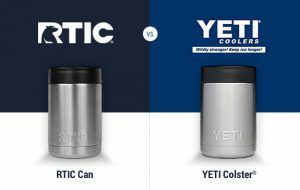 If you appreciate world famous brand and are ready to overpay for it, then the Yeti Colster option will fit you more, but if you need high-quality features from your can cooler and think that its label doesn’t cost three times higher, than the best choice for you will be definitely the RTIC can cooler. It’s up to you what choice will you make, we want you to know that whatever option from these two variants you choose, you will get quality, high-end product.